Our beloved mother, grandmother, sister, and aunt Mavis Munk Hansen completed her lifetime of service on the Earth July 30, 2018. Mom was born at the post office of the Ute Indian reservation in Talmage, Utah, August 8, 1918. She was the second oldest of eleven children of Louis and Dagmar Munk. At age of 3 months old with her older brother and parents loaded into their wagon they moved to Manti Utah. She grew up attending schools in Manti and Gunnison Utah. Graduating from Gunnison High School, she married Joseph Howard Hansen November 30, 1938. They had 6 children: Louis (Bud), Gary, Tom, Carol, Richard, and Lynn. 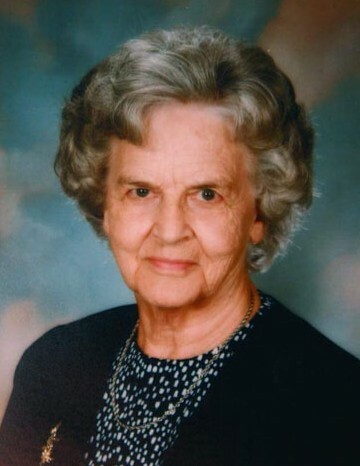 They lived in the Salt Lake area after marriage, then moved to Nephi in November of 1944, where she would make her home the remainder of her life and raise her family. Although a wife and mother first, she also worked as a nurses aid for many years, as well as an agricultural surveyor for the USDA. One of her greatest passions was service in the church in which she held many stake and ward callings. Perhaps one of her favorite callings was spending over 20 years as a gospel doctrine teacher, taking only a short break in 1984 to serve a full time 18 month mission in Denver Colorado. Other callings and activities included: Ward Relief Society president, Young Women’s presidency, the singing mothers – a traveling singing group that performed in various locations including the tabernacle. Besides family and church, another love she had was for sports. She enjoyed watching her children performing in athletic events and was a life-long fan of watching sports on television. She was preceded in death by her husband Howard in 1974, one son Bud in 1998, two grandchildren, two great grandchildren, and 6 siblings. She is survived by her 5 children, Gary (Barbara), Tom, Carol, Richard (Gay), and Lynn (Kris); 25 grandchildren, 60 great grandchildren, 17 great-great grandchildren. Our family would like to express our heartfelt love and appreciation to her care givers, Doctor Jones, CVMC Staff, CVMC Home Health Care, Laurel Groves Assisted Living Staff, and Mike and Brace at Anderson Funeral Home. All are invited to celebrate her life with us at a viewing on the evening of Thursday August 2nd , 2018 from 7:00 p.m. to 9:00 p.m. at Anderson Funeral Home in Nephi at the corner of 300 North and 100 West and a morning viewing on Friday August 3rd, 2018 at 10:30 am, followed by funeral services at 12:00 pm in the LDS Chapel located at 100 East and 200 South in Nephi, Utah. Interment will take place at Vine Bluff Cemetery.